CLEVELAND (AP) Indians pitcher Carlos Carrasco has been removed from their game against Minnesota after he was struck on the right arm by a line drive in the second inning. Carrasco hopped off the mound and went down to his knees on the infield grass after he was hit by Joe Mauer’s leadoff liner. Manager Terry Francona and a team trainer visited Carrasco, who remained on his knees for several moments. Carrasco then walked to the dugout with the trainer and was replaced by Oliver Perez. 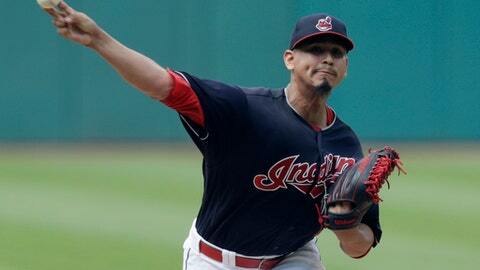 Minnesota scored four runs in the first off Carrasco, who entered Saturday’s game with an 8-4 record. It looked as if Carrasco was struck on the elbow, but the team announced he was taken to a hospital for examination of a forearm contusion.